In 2009, 100 people were injured in Oklahoma car crashes every day, and one car accident occurred every seven minutes. Perhaps most shocking is that out of the 694 people killed in motor vehicle accidents that year, 45% of them were driving or riding in light trucks. This is in direct contrast to one of the reasons people drive larger vehicles – they feel safer in them. 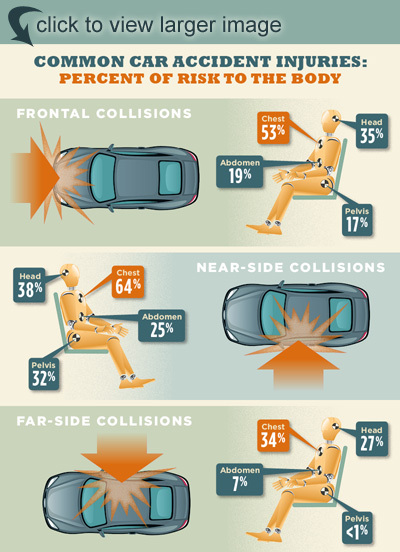 It’s important for drivers to understand the risks not only of the types of vehicles they drive, but that they are 17% more likely to be injured or killed in a car crash when restraints are not used. McIntyre Law, P.C. has created this infographic to help drivers learn when it’s most dangerous to be on the road, fatality statistics according to vehicle type, and how important it is to wear seat belts. It is our hope that with this information, Oklahoma drivers can make good choices to stay safe, and help keep the roads safe for everyone. If you or a loved one has been injured in an Oklahoma car crash, contact the attorneys at McIntyre Law, P.C. to learn more about your rights and how we can help you recover from motor vehicle accident injuries. Call 1-877-917-5250 now for a free consultation.